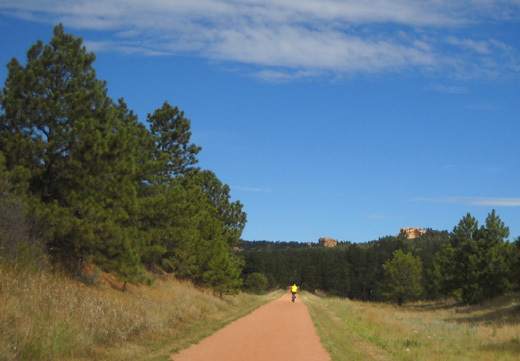 When we were here in May we spent some time riding our bikes on the New Santa Fe multi-use trail that runs for fifteen miles through the eastern part of the USAF Academy property and up to Palmer Lake. 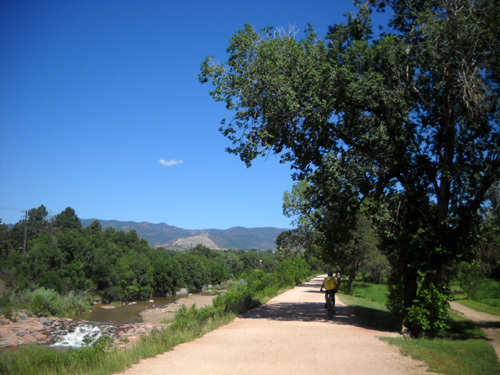 We rode just nine miles of the trail in the spring and did not get on the Pike's Peak Greenway south of the Academy at all. Now we've ridden all of the New Santa Fe Trail and most of the greenway. 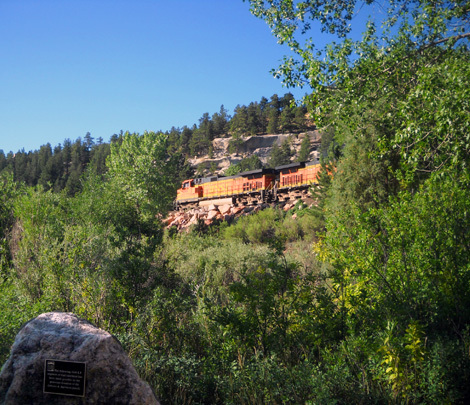 Together, the two trails stretch one way for about twenty-six miles and form a part of the extensive Front Range Trail system that extends the entire length of Colorado from its borders with Wyoming and New Mexico. 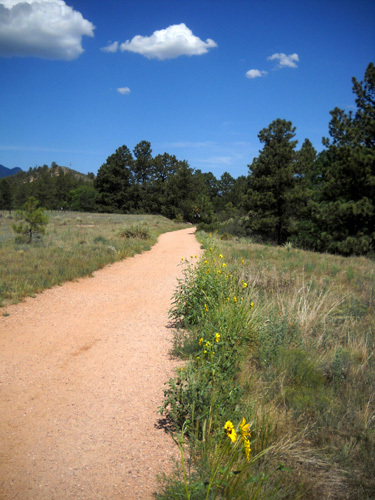 El Paso County and the City of Colorado Springs have a wide network of multi-use paths that connect parks in the popular "open space" system. You can ride, run, or walk on these paths and reach just about any place in the area, especially if you are willing to share the streets with other vehicles in some sections by also using designated bike lanes. It's a wonderful amenity for local residents and visitors alike, a model more cities should emulate. 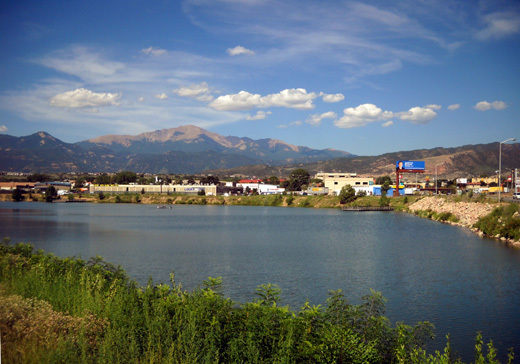 A pond along the Pike's Peak Greenway; the 14,110 -foot peak is in the background. 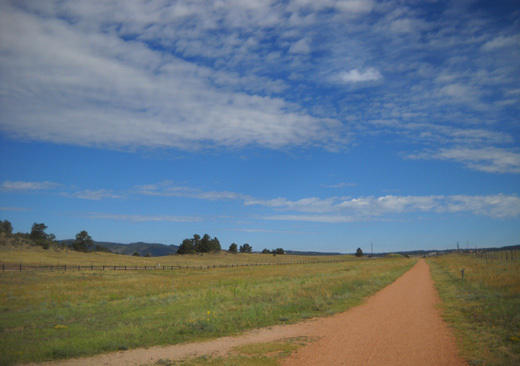 I wrote quite a bit about the New Santa Fe Trail in the May28, 2011 entry and included 40+ photos on two pages. 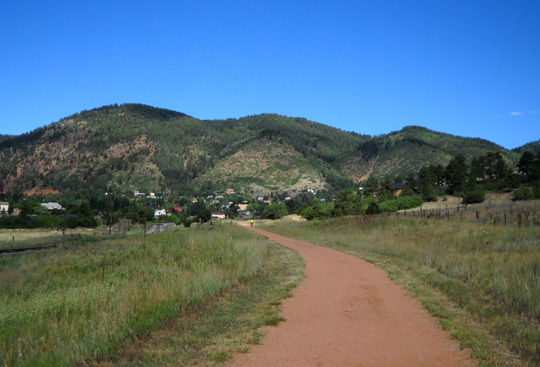 I'll add new information and photos in this entry for the Pike's Peak Greenway and the section of the New Santa Fe Trail we didn't see previously. I took some of these pictures, like the ones on the greenway just above and below, while riding my bike. That works as long as the trail/path is smooth and flat and no one is coming in either direction! It reminds me of my "windshield shots" in the truck when I'm driving . 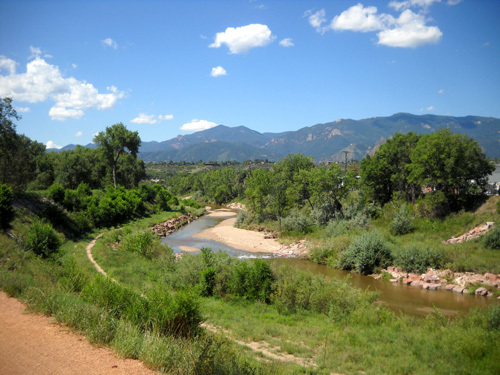 . .
Jim and I have ridden our bikes quite a few miles since we arrived in Colorado Springs two weeks ago. 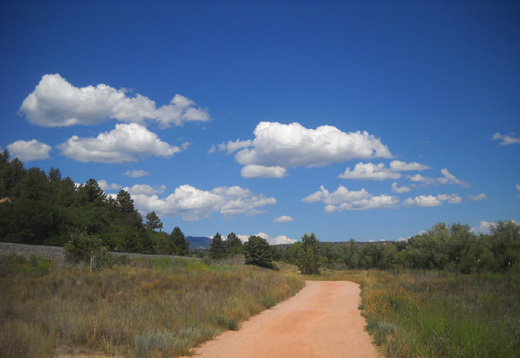 We can access all sorts of trails and roads right from our campsite, or drive to a nearby trailhead just out the north gate of the USAF Academy. 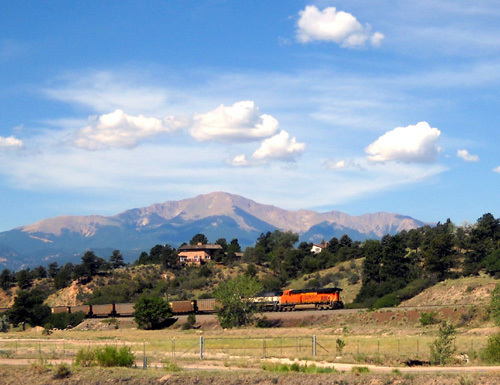 In addition to all the miles we've ridden on the Falcon Trail and interior roads on the Academy grounds, we've done several rides north and south on the New Santa Fe Trail and the Pike's Peak Greenway -- all the way north to the Palmer Lake Recreation Area and south to the zero mile point in Colorado Springs. Our longest ride was yesterday, when we did 31+ miles together. We've also done several 20+ mile rides. Thirty-one miles is the longest bike ride either of us can remember in many years. I did 30 miles in one ride at Brazos Bend State Park in Texas in March and 35 total miles another day in two rides; I don't remember the longest I've ever ridden. I did a lot of cycling when I was in my 30s but my focus was more on running long distances than riding. Jim doesn't think he's ridden 31 miles since the early 1980s. He remembers going 50 miles one time in the past. Now at age 63** -- today is his birthday! -- his goal is to work up to 100+ miles in one day on the Michelson Trail in September. 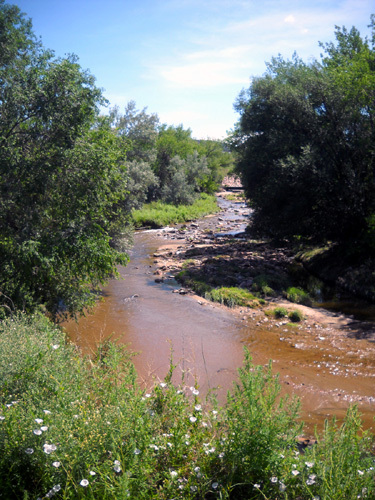 The paths also follow scenic creeks. ** Happy birthday to Jim! He'd rather not acknowledge birthdays anymore but enough people know the date that he received lots of e-greetings from friends and relatives. He appreciates the kind thoughts and gentle humor. 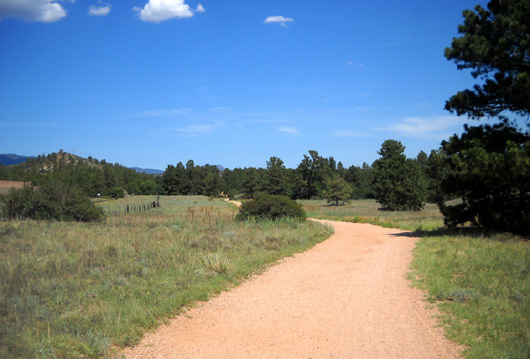 In May we rode all of the New Santa Fe Trail through the Academy and about three miles north to the Baptist Road trailhead, which has a bathroom and nice picnic area. 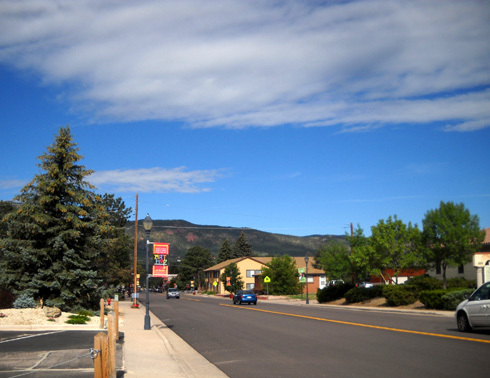 This time we went another six miles farther, through the town of Monument and up to Palmer Lake. "Up" as in both north and uphill. The trail is pretty straight just north of Baptist Rd. but it isn't as flat as it looks. 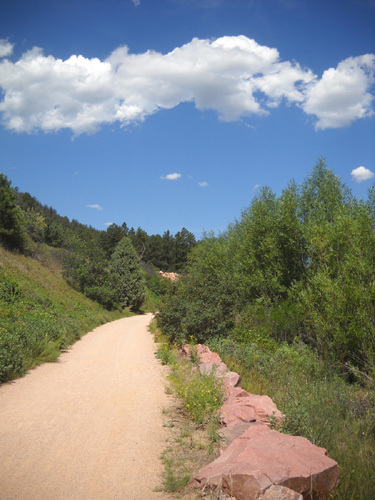 The NSF Trail and Pike's Peak Greenway have a net slope uphill from downtown Colorado Springs north to Palmer Lake. Per our GPS the range is from about 5,950 feet at Mile Zero downtown to 7,280 feet at the north end of Palmer Lake. Jim's riding ahead of me; note the two rock formation to the right. The net grade is pretty gradual but we can definitely tell that it's more difficult to pedal going north. It's noticeably easier to ride -- and coast -- southbound. In addition, there are numerous shorter, steeper hills along the way. It's a real roller-coaster but that makes it more fun to ride. The entire trail is dirt/crushed gravel and fairly smooth except after gully-washers; then the sloped sections get a little rutted. The section that was new to us from Baptist Road to Palmer Lake has a net elevation gain of about 600 feet. That doesn't sound like much over six miles but it was enough for me to feel like I was struggling to keep up with Jim. We could feel a big difference when we turned around and went back downhill toward the Academy -- pure fun! We felt like we were flying. 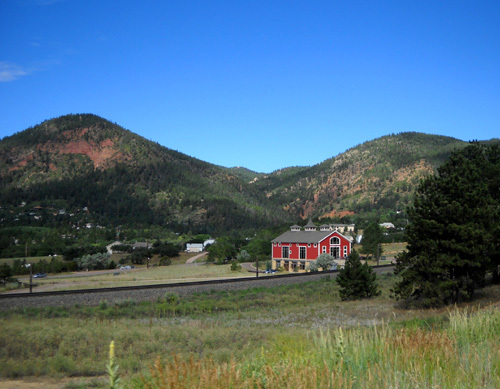 The slowest part of this section is through the small town of Monument (next photo). 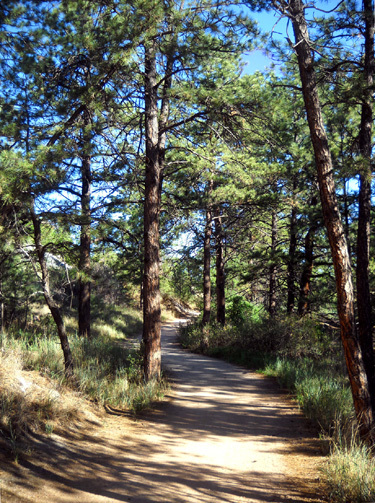 The trail crosses four or five streets and traffic doesn't always stop for trail users. Gotta be careful there and at the small country roads the trail intersects. There are several shelters in this section where cyclists, hikers, and runners can get out of the sun or rain. 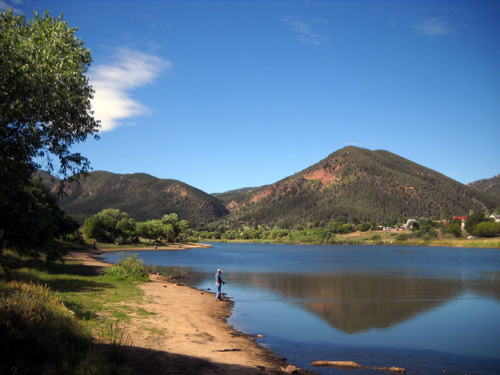 There are also several trailheads with water available -- Baptist Road, Monument, and Palmer Lake. We turned around at the north end of the lake. The Front Range Trail continues north from there; a spur trail goes into town but we didn't follow it. 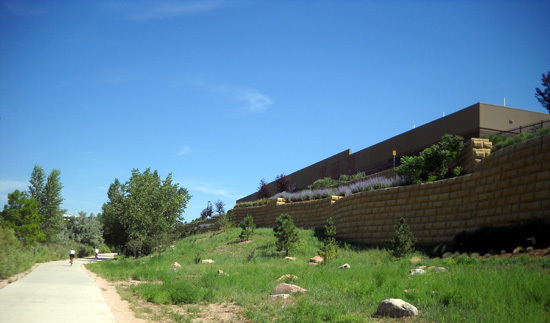 Because of the towns we've seen more people on the section of the New Santa Fe Trail between Monument and Palmer Lake than farther south through the Academy. 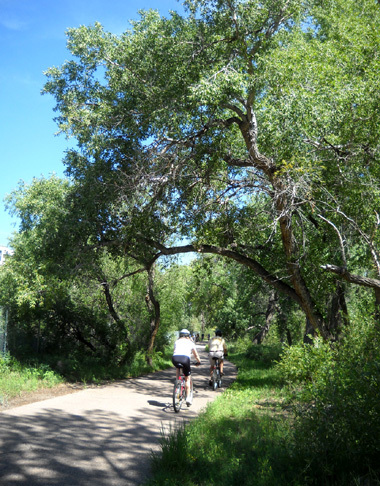 This multi-use path continues south from the New Santa Fe Trail for about sixteen miles. 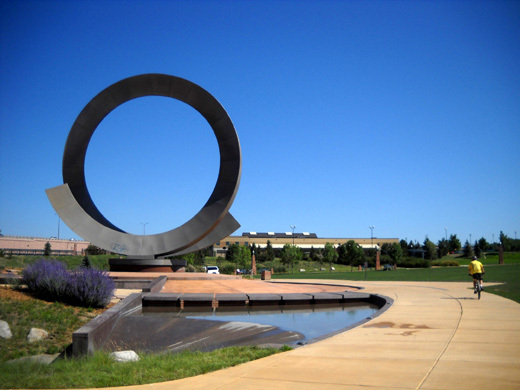 It begins at the southern boundary of the Academy grounds and runs through Colorado Springs to the city of Fountain. 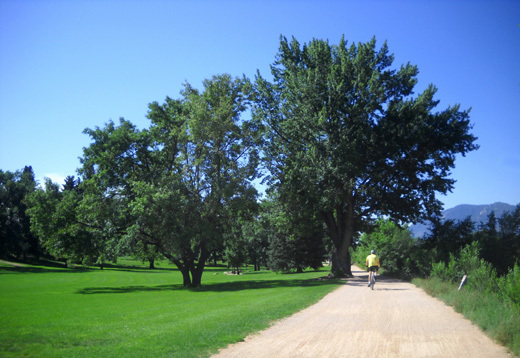 We've ridden on it several times but have gone only as far as Memorial Park, just east of Tejon Street and approximately eleven miles past the Academy gate. Above and below: the northern part of the trail is more remote. We've also ridden on several spur trails that go off the main trail, and Jim followed a bike lane to the Dodge dealer Saturday when he picked up the truck after servicing. This map shows many of the spur trails that you can take. Although there are some pleasant wooded and open sections it is more urban. It has a good dirt/crushed gravel surface going south until Woodman Road, where it becomes asphalt and concrete to at least Tejon Street. 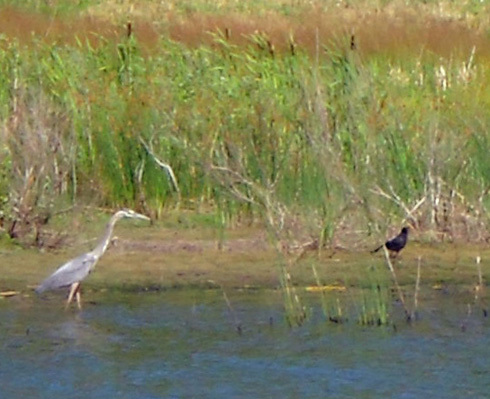 It has numerous spurs going east and/or west to other neighborhoods. 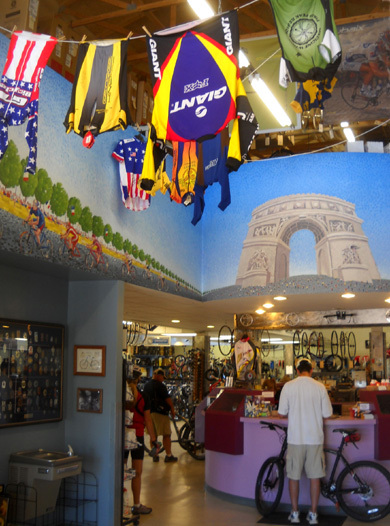 There are businesses close to the trail in some places, like the convenient and popular Criterium Bicycle shop that offers restrooms and cold water to passersby. 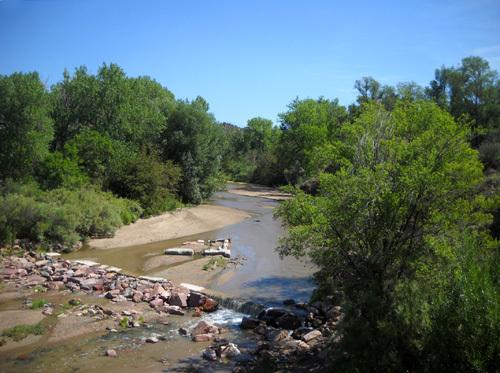 It follows Monument and Fountain Creeks closely and has several nice wooden bridges over them. It also follows the railroad tracks more closely in some places but there are enough other distractions and screening vegetation that passing trains weren't a problem for us. It has even more trailheads than the New Santa Fe Trail. We like the greenway as much as the New Santa Fe Trail even though it is more urbanized and "tame." 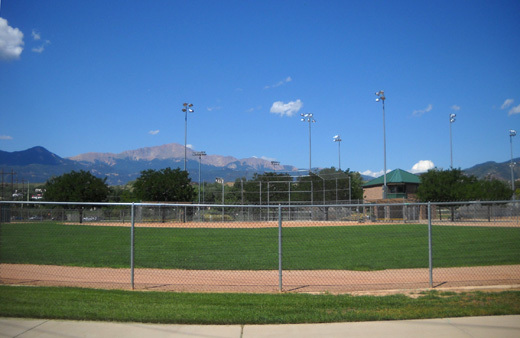 It passes through such a wide variety of areas that it's always interesting -- grassy parks with picnic tables and ball fields, a college campus, a lake, shops and office buildings, apartments and houses. This street by an office building wasn't busy on the weekend. This huge Costco is next to the greenway but is nicely landscapaed. Some places are wooded and shady and feel quite remote, despite their proximity to homes and businesses. Others are closer to busy streets and go under the freeway. 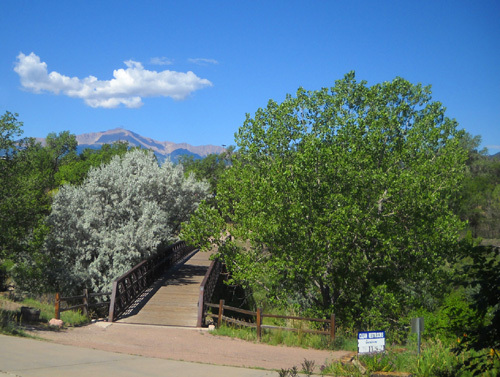 The Pike's Peak Greenway is easier to ride than the New Santa Fe Trail. The wide, smooth concrete and asphalt surfaces are one reason. 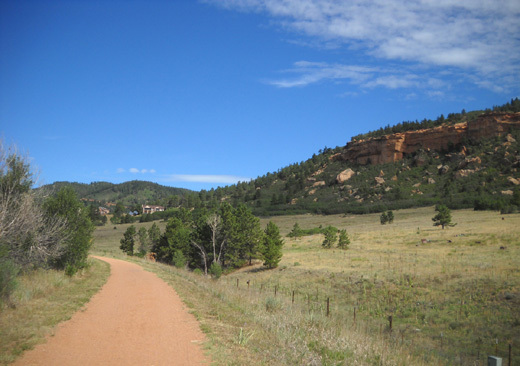 The greenway is also less hilly than the trail through the Academy and north to Palmer Lake and there isn't as much elevation gain going northbound, or at least we didn't feet it as much. 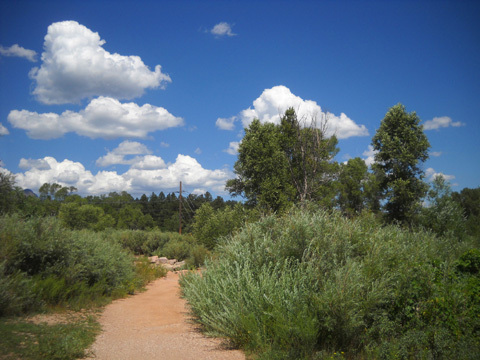 Above and below: your choice -- use the greenway or take the single-track trail by the creek. We rode this trail on two weekdays and this past Saturday and Sunday. On the weekend it was very busy with walkers, runners, cyclists, and rollerbladers. We had to slow down so we didn't run into anyone. 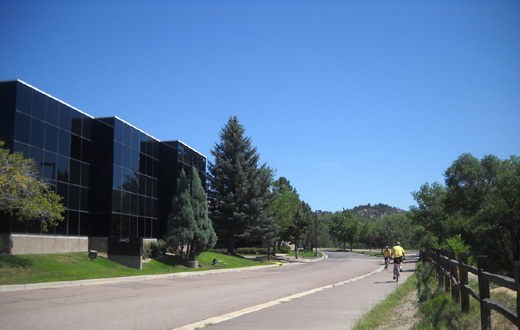 Despite the huge number of people who ride bikes in the Springs there are still clueless folks on foot who hog the greenway, walk on the wrong side, or step right out in front of bikes without looking. I was happy to see so many fit-looking men and women in their 60s, 70s, and maybe even 80s using the trail. 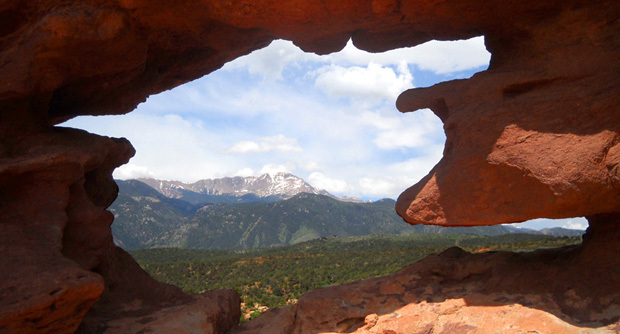 We see more folks of all ages in Colorado who look fit than in most other states. The trail continues south from Tejon Street for another couple miles on various surfaces but we haven't gone any farther than that on the main trail. As mentioned earlier, we have taken several of the side trails. He turned around at the far end and is coming back. Go back to the top of this page and read the quote again . . .
We may be in our 60s now but we still like to play. 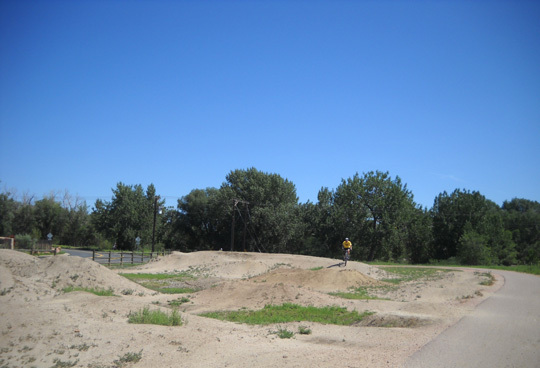 In summary, we are totally impressed with the trail network and open space park system around Colorado Springs. It's one of the main reasons we like to visit the area. Monument Creek is pretty low this weekend. 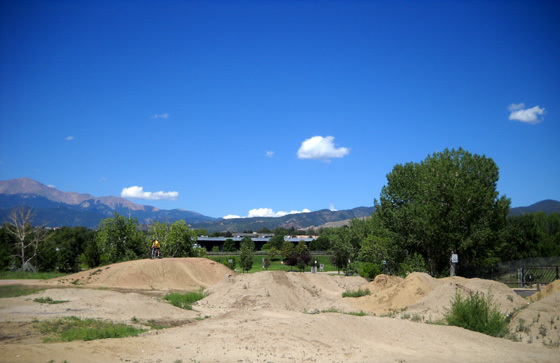 According to this 'way outdated city Parks and Rec webpage, in 2007 Colorado Springs had 118 miles of urban bike trails and about 61 miles of unpaved mountain bike trails (plus additional miles of bike lanes on city streets). More miles are added periodically but I don't know what the current total is and I don't know if these numbers include other trails in the metro area but outside city limits, such as the Santa Fe Trail and the Falcon Trail. There are even more miles of trails than this for hiking and running. They're small but deadly. They are murder on bare feet and doggie paws, too! Poor Cody. About a week ago I got my fifth or sixth flat in recent months. Jim fixed it so I could ride that day but we knew we'd have to find a more permanent solution to this chronic problem. I'd been half-heartedly researching new tires for the TriCross anyway; in addition to something sturdier, I need more traction for trails. I talked with the guy who sold me the bike in Roanoke (he rides a TriCross, too) and with employees at ProCycles and Criterium Bikes in Colorado Springs to get their recommendations. They listed at least half a dozen different brands/models that met my criteria and I compared features and prices online. The tires and tubes were fine all last week and over the weekend during several long rides, including the 31-miler we did yesterday, so we put off getting new tires . 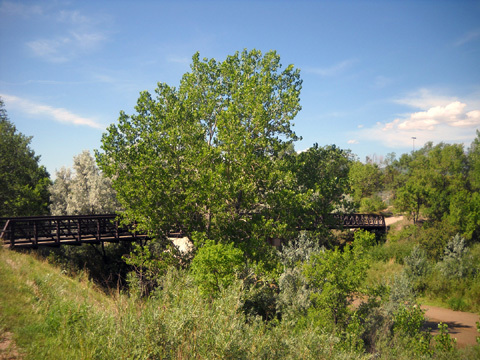 . .
Greenway bridge across Monument Creek; Criterium bike shop is to the left. Last evening when Jim was changing my bike pedals from clip-in Times to the plain step-ons that came with the TriCross something happened to the back chain ring and he wasn't able to fix it. The chain was rubbing and difficult to move between the gear sprockets. My brakes were also mushy and I still needed new tires. We decided we'd better take the bike in to get it repaired before leaving town this week. I took this picture of the greenway and bridge from the entrance to the Criterium bike shop. John, an experienced and very pleasant mechanic, determined that the shifting problem was caused by a bent derailleur hanger that is welded to the front part of the frame. Jim thinks he may have hit it with the hammer when he was trying to get my Time pedals off yesterday. We were glad we didn�t have to leave the bike and go back for it later. John was able to file the hole in the hanger a little bigger in order to raise the derailleur so it clears the sprockets. That was better than trying to force it with pliers, which might have broken the weld. One of the strands in the cables for the front gears was also broken and starting to unravel; John replaced it. He rode the bike outside to make sure all 27 gears are working properly, and I tested it before leaving, too. We also got new tires and tubes finally. The shop installed them for free and the cost was about the same as we'd have paid online. My original TriCross tires were only 32c wide, lightweight, and better suited to pavement than dirt, sand, or rocks. I need tires that won�t go flat as easily with thorns, glass, sharp rocks, or pinching and I want more traction on trails. Getting tires for traction is easier and cheaper than getting a �bomb proof� tire that is less likely to go flat but I think I found a good compromise. We ended up getting 700 x 38c Specialized Crossroads Armadillo tires. 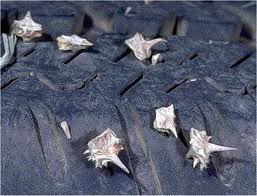 They aren't the really expensive ones that have Kevlar inside but they are supposed to be puncture-resistant. I have some type of Armadillos on my road bike and they've worked very well against punctures and pinching. We also got wider, thicker tubes, so now I have two lines of defense against flats. My bike is noticeably heavier and I won�t be able to ride on pavement as fast, but speed isn�t my goal. These tires have more tread than my old ones. The center is smoother for a decent ride on pavement. The sides are more knobby for better off-road traction. 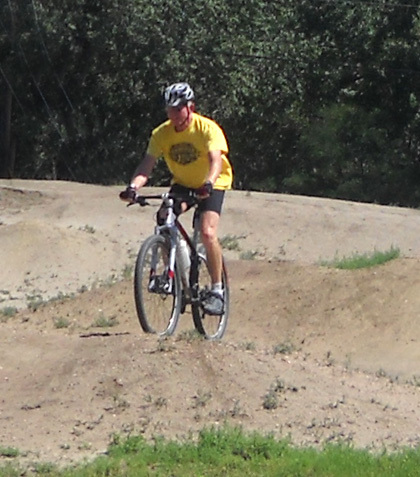 I�ll still have to be careful in loose rock, sand, and on curves, however, because they aren't as knobby as mountain bike tires. After we got done at the bike shop Jim continued riding for a while and ended up with 21 miles today. 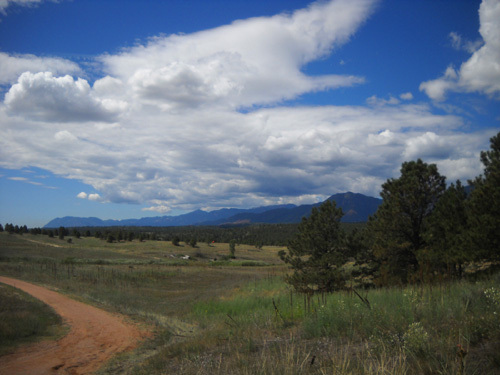 It was very hot while he was out there -- in the 90s F. He rode out and back to Garden of the Gods on the Stinson Trail, a paved bike path off the Pike's Peak Greenway, then back to the campground on the greenway, New Santa Fe Trail, and Academy roadways. I returned to the camper with my bike in the truck (someone had to drive the truck home!) and got my exercise after supper when it was cloudy and cooler � a walk with Cody through the campground and a few miles on my bike to test all the gears. They work great and it's easier to ride on the gravel roads through the campground with my new tires.